This is Newfoundland and Labrador’s largest public cultural space. Here, history, heritage and artistic expression come together. Our staff and volunteers are ready to make your visit rewarding and enriching as you explore all The Rooms has to offer. Start at Visitor Services on Level 1 near the main entrance, where friendly and knowledgeable personnel will welcome you and answer your questions. The Rooms is a portal to the many stories this province and its people have to tell. Here, you'll find collections, exhibits and programs that tell our stories and interpret our natural world through art, artifacts, archaeology, architecture and archival records. 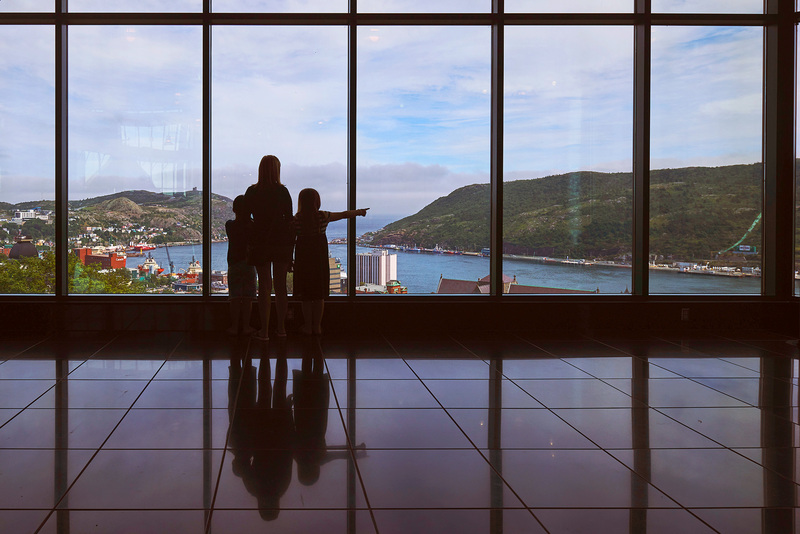 A remarkable feature of the skyline of historic St. John's, The Rooms unique design mirrors the fishing rooms where families came together to process their catch. This building, like the collections and exhibitions it houses, represents a tribute to our people and a place in which to preserve our history and culture for generations to come. To learn more about this remarkable building and site, see About Us. Enjoy your visit—and please visit again! The Rooms Café on Level 4 maintains the same hours as listed above, however on Sundays doors are open at 11am to allow access to the Café. The Rooms is closed on Christmas Eve, Christmas Day, Boxing Day, New Year's Eve, New Year's Day, Good Friday, Victoria Day and Remembrance Day. We are pleased to offer a 35 per cent discount on our regular admission to active and retired members of the military and their spouses. To redeem this offer, simply present your Military personnel ID or Veteran ID upon arrival to the Admissions Desk. Admission is free between 6 - 9 pm on the first Wednesday evening of the month. There may be a charge for some Wednesday evening programs and events. General admission fees do not apply to the Archives. First-time users of the Archives pay a one-time $10.00 fee (plus HST) to obtain a permanent Researcher Registration number. Access to Red Oak Café on Level 4 does not require admission. All general admission and event ticket sales are final. No Refunds. The Rooms is located at 9 Bonaventure Avenue in the heart of St John’s. Click the map to find us. Parking fees are in effect 24 hours a day, seven days a week for a fee of two dollars an hour. 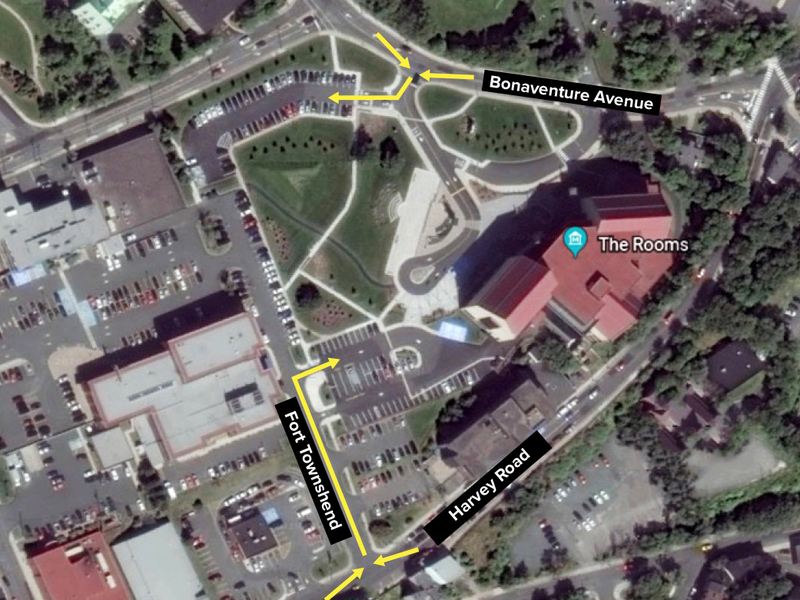 Visitor parking can be accessed from Bonaventure Avenue and from Fort Townshend via Harvey Road. Enter the main parking lot via Bonaventure Avenue. Additional parking is available via Harvey Road. Parking is free for members of The Rooms. Members parking must be validated upon entry at the Visitor Services desk. Parking payment terminals are located inside The Rooms lobby and at each parking lot exit. If you are using debit or cash you must use the payment terminal located in The Rooms. Parking lot payment terminals accept Visa and Mastercard. These maps can familiarize you with the layout of The Rooms. Click on a floor map to enlarge it. Orientation is included in the price of admission. Orientation is approximately 15 minutes in length and is not offered during free admission periods. No appointment is necessary. Exhibition Tours, also free with the cost of admission, are offered at designated times and vary in length. Our Visitor Services team—located at the desk near the entrance on Level 1—is ready to welcome you to The Rooms and to help make your visit enjoyable and enriching. The Rooms is accessible. 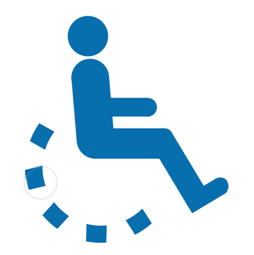 Wheelchairs and strollers are available to be signed out free of charge from Visitors Services. Lost & Found is located at Visitor Services on Level 1. If you realize after your visit that you have misplaced something, call (709) 757-8090. The Rooms offers free wireless internet. Please note: this is an unsecured network—information sent or received may be accessible to third parties. Users are responsible for protecting their own devices and The Rooms is not responsible for the security of data transmitted. Please help us protect our visitors, staff, volunteers and valuable collections by following these practices while visiting The Rooms. The use of scented products at The Rooms is to be avoided, in order provide employees and visitors with a healthy and safe environment. The use of scented products has the potential to create an unsafe environment for our employees and to visitors due to the associated serious health risks. Brief cases, backpacks and oversized bags are not permitted in the galleries or inside the Archives. 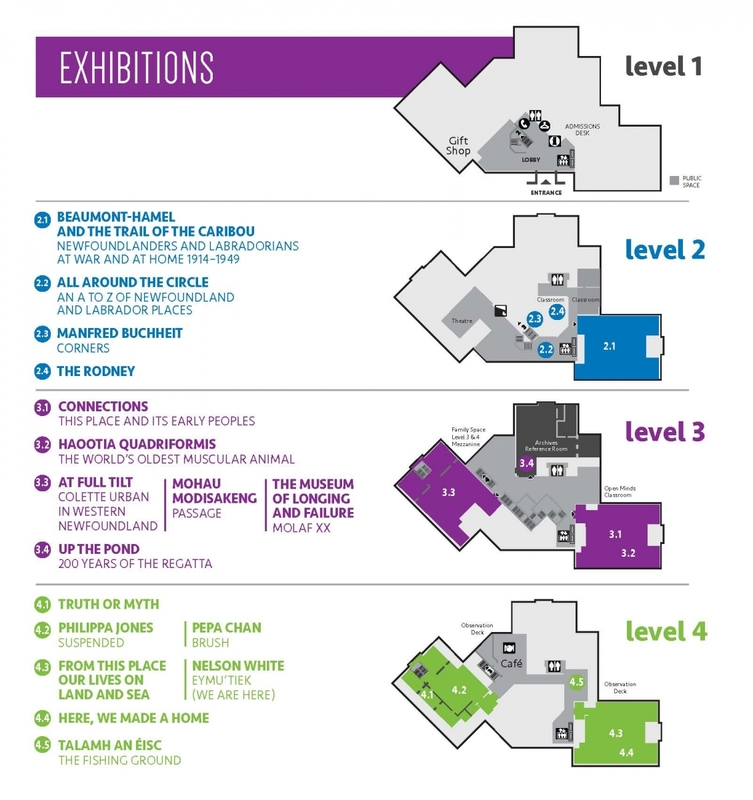 Please check these with Visitor Services on Level 1. Visitors to the Archives can access lockers on Level 3. Food and beverages are permitted in the public spaces only, not inside the galleries or the Archives. This is enforced to protect our collections and items on display. The use of cellular phones is not permitted in any of our galleries or inside the Archives. The Rooms is a smoke free building. To protect our collections, flowers or plants cannot be brought into The Rooms. This includes bouquets, corsages and flowers worn in the hair. Please do not touch the artifacts or artwork on display, except where clearly permitted. Children are welcome at The Rooms. For their safety and to protect the items on display, we ask that children be supervised at all times. An announcement is made 15 minutes before closing. All visitors must be prepared to leave The Rooms at closing time. Please refrain from shouting, running and rowdy behaviour that might interfere with other visitors’ experiences or result in injury. In the event of an alarm, please prepare to exit, following any instructions provided by security. If you require assistance, please ask the nearest security person. Effective November 1, 2015 all professional and amateur photography sessions at The Rooms must be pre-booked. All photography sessions both amateur and professional must book an appointment through Rentals, at 709-757-8099 or email rentals@therooms.ca. Individuals and groups are required to check-in with Visitor Services to identify themselves and receive an authorization pass. Please limit your arrival to 10 minutes prior to your scheduled time. Those who have not booked ahead of time will not be accommodated. Photos must be taken during public hours and must be concluded within the given timeframe. All groups MUST follow the directions of Security and Visitor Services staff or they will be asked to leave the premises. NOTE: Verbal abuse will not be tolerated. The Rooms is committed to creating and maintaining a safe environment for visitors, clients and employees. The Rooms expects everyone to be treated with respect and integrity. Maximum ½ hour session. It is important that you arrive a little early to check in with the Visitor Services Staff and sign the agreement. In the event that a party arrives late for an appointment please note that the time will be reduced and will not be extended, as there may other bookings immediately following. To protect our collections, flowers of any kind are not permitted in The Rooms; this includes bouquets, corsages, boutonnieres, or flowers in ladies’ hair (these must be removed prior to entering the building). Upon arrival, the photographer AND member of the booking party must sign at the Visitor Services desk. Individuals and groups cannot be staged on the stairs. Fire Code Regulations prohibit photographers from placing blankets, bags, or props of any kind on the floors or on the stairs. Photographers are not permitted to use tripods/unipods or any additional setup. Hand held cameras only. Furniture cannot be moved or rearranged in any capacity. Standing on the furniture is not permitted. The public cannot be asked to move to accommodate any kind of photography. During the holiday seasons, the removal of ornaments, etc., from the tree is not permitted. Restrictions are placed on peak season and peak times (see below for restrictions). For the comfort of all The Rooms visitors, noise and disruptions should be kept to a minimum. Photographers are not permitted to conduct sittings, take appointments or use The Rooms as a studio space. Photographers can be asked to leave at any time without notice. December 10th – January 10th in any year.